Years ago when I visited Zagreb, capitol of Croatia, I became acquainted with Croatian Naive art, which became famous in the 1930's as a local variant of folk painting. It frequently showed pastoral scenes, although the influence of the modern age can be seen in some paintings of this genre. 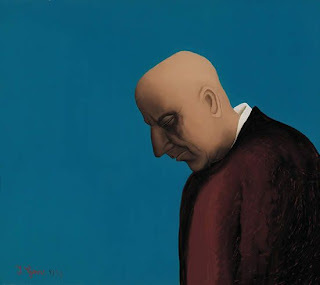 The most famous Croatian naive painter is Ivan Generalic. 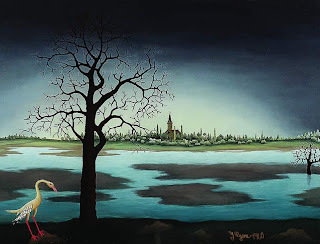 I was curious to know whether or not Croatia's neighbour, Serbia also had naive art that was comparable such art from Croatia. What I found on Google was remarkable. 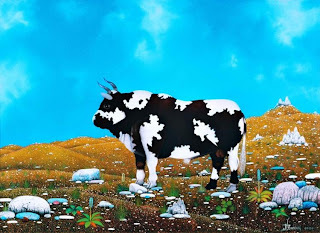 Serbian naive art is remarkably similar to that of Croatia, dealing with pastoral themes with an edge that at times seems to be from from another world. Anyone who is familiar with the Serbian and Croatian languages would not be surprised at this. Indeed, a mere twenty five years or so ago, they were referred to as Serbo-Croatian, one language with a hyphenated name and two alphabets. The hatred and bloody warfare between Croatia and Serbia has created a formidable rift that knocked the hyphen out of Serbo Croatian and redefined them as totally separate. Serbs nurse grudges of Croatian perfidy during World War Two. And Croats resent keenly the political dominance of Serbia during the Tito years from 1945 until his death in 1980. During the 1990's , the bloody civil war that ripped Bosnia, Croatia and Serbia leaves a collective psyche in the region that still bears ugly scars. Being of Croatian and of Jewish ancestry, this history of conflict in the region touches me deeply. The closeness of the languages of the two countries seems to hint at a deeper link between the two countries. 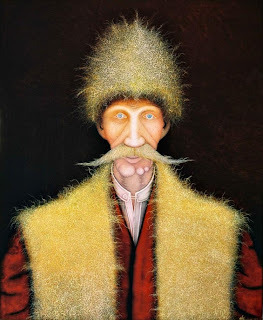 When I look at Croatian and Serbian naive art, this feeling is inescapable that the ancestors of those who have fought in recent years might have once been brothers. As a child of intermarriage, the image of a table divided by faith is a personal one. I have sat at a table with ham on one end and kosher food on the other. It is from this experience that I try to imagine the first generation in which brothers embraced different faiths, when one brother would name his child Hasan and the other would name his child Ivan. As a Jew, it is hard for me to imagine Eastern Orthodox Christians and Roman Catholics willing to kill each other over theological differences that to a Jew seem trifling. Sometimes peace must come from abroad. In America, Serbs and Croats have lived together in areas where they live in close proximity. Gandhi developed his sense of an Indian identity that transcended caste and local nationality while working in South Africa in the early part of the twentieth century. Cuisine too has a way of transcending borders. Turkish coffee is also called Greek coffee. I had always assumed that baklava is Greek. Others tell me that is in fact Arab. I would like to see a map of the world drawn according to how people make coffee or if they prefer tea over coffee. I am very familiar with the passions that have driven Serbs and Croats apart and shredded the map of Bosnia Herzegovina. At the same time, the prism of linguistic and artistic similarities is captivating to me as well. I hope that some day that this vision of Balkan similarities be apparent to those who are gripped by the passions of the region. The ravages of war in the region have left much to be forgiven. Perhaps some day the scars on the Balkan lanscape and psyche will fade from the beautiful face of that tormented region. I look back to the home of my mother's ancestors with sadness. As a Jew, as an American, I feel like I have stepped back from a beautiful painting and discerned its beauty from afar. Perhaps one day the descendants of the brothers who once broke bread together will sit together yet again.